1 Timothy 2:1-4 First of all, then, I urge that supplications, prayers, intercessions, and thanksgivings be made for all people, for kings and all who are in high positions, that we may lead a peaceful and quiet life, godly and dignified in every way. This is good, and it is pleasing in the sight of God our Savior, who desires all people to be saved and to come to the knowledge of the truth. 2 Corinthians 8:1-6 We want you to know, brothers, about the grace of God that has been given among the churches of Macedonia, for in a severe test of affliction, their abundance of joy and their extreme poverty have overflowed in a wealth of generosity on their part. For they gave according to their means, as I can testify, and beyond their means, of their own accord, begging us earnestly for the favor of taking part in the relief of the saints —and this, not as we expected, but they gave themselves first to the Lord and then by the will of God to us. Accordingly, we urged Titus that as he had started, so he should complete among you this act of grace. 1 Peter 2:13-16 Be subject for the Lord’s sake to every human institution, whether it be to the emperor as supreme, or to governors as sent by him to punish those who do evil and to praise those who do good. For this is the will of God, that by doing good you should put to silence the ignorance of foolish people. Live as people who are free, not using your freedom as a cover-up for evil, but living as servants of God. 1 Peter 4:19 Therefore let those who suffer according to God’s will entrust their souls to a faithful Creator while doing good. Romans 15:30-33 I appeal to you, brothers, by our Lord Jesus Christ and by the love of the Spirit, to strive together with me in your prayers to God on my behalf, that I may be delivered from the unbelievers in Judea, and that my service for Jerusalem may be acceptable to the saints, so that by God’s will I may come to you with joy and be refreshed in your company. May the God of peace be with you all. Amen. 1 Corinthians 1:1-3 Paul, called by the will of God to be an apostle of Christ Jesus, and our brother Sosthenes, To the church of God that is in Corinth, to those sanctified in Christ Jesus, called to be saints together with all those who in every place call upon the name of our Lord Jesus Christ, both their Lord and ours: Grace to you and peace from God our Father and the Lord Jesus Christ. Colossians 1:1-2 Paul, an apostle of Christ Jesus by the will of God, and Timothy our brother, To the saints and faithful brothers in Christ at Colossae: Grace to you and peace from God our Father. 2 Timothy 1:1-2 Paul, an apostle of Christ Jesus by the will of God according to the promise of the life that is in Christ Jesus, To Timothy, my beloved child: Grace, mercy, and peace from God the Father and Christ Jesus our Lord. Clearly the Bible tells us that it is God’s will for “all people to be saved and to come to the knowledge of the truth” (1Timothy 2:4). Then as believers we are “to be conformed to the image of His Son” (Romans 8:29). We are taught things in the Bible that will help us to do the things that please God. 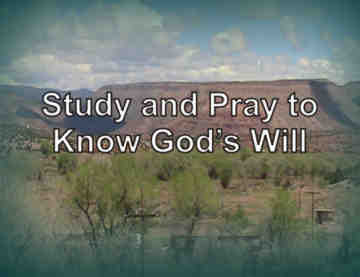 When you are looking for God’s specific “plan” for your life you must fervently pray for God to show it to you. Remember when you are praying that God will open and close doors along the way. When God opens a door – walk through it. When God closes a door; do not open it back up. Make your plan as though God will bless it and then execute it. He will reveal to you what He wants for you and don’t ever forget that His grace is sufficient for whatever come what may. That’s a promise! You are most welcom viliame morisio! Stop in again sometime. Hola estefania, Permítame que me refiera a traducir al Inglés y a continuación, responder a usted. Hello Stephanie, please allow me to translate into English and then respond to you. Hola estafania, me encantaría escuchar tu voz y estoy muy feliz de haber dejado un bello comentario. Bendiciones para usted! Hablo poco español, así que no puedo decir más. Hello Stephanie, I would love to hear your voice and I am very happy you have left this beautiful comment. Blessings to you! I speak little Spanish so I can not say more. what’s wrong about being a guy?! These quotes were awesome! they really helped me out! thanks so much… i am officially a fan! The passage you list from John is actually John 7:17. Yes sir you have that right. I have made the correction thank you. Thank you for the inspiration sharing of God’s will through scriptures. God has blessed me with many talents over the years and I must stay focused and use them to build help build his kingdom. Pray for my strength and I journey along. The word is good all the time. Thank you Sharon. It is good to see you here. This has helped me tremendously already and I’ve only been on it for a few minutes! Thank you so much for sharing this. This has been on my heart for the longest time, I just needed to know some scripture to help me better understand what God wants me to do in order to know his will for my life. Thank you for making this awesome website!!!! I enjoyed reading the scriptures you provided. But we do need to be careful about the reason number 2. Is it your hearts desire. Keep in mind our heart is sometimes evil and led astray. Just because our heart wants something does not make it right. Sometimes our hearts desire evil. Therefore I would not apply number to at all. This is a wonderful reading and reference. I too agree w/ Pastor Charlie. God knows the desires of our heart, yet often, the desires of our heart are not of Him. I.E., desiring things or relationships that are not of God but of the flesh, or yes, sometimes our heart desires what is evil/not of Him. We’ve been taught by movies and fairy tale logic, not the Word of God, that ‘if you love each other, that’s all that matters’, so you desire a ‘love/mate but haven’t prayed to God for he right and perfect one for you; sometimes, the one who loves you or the one you love is not the one God has willed for your life—some relationships exist from a desire of the heart, but may not be healthy ones, or ordained by God and the couple is ‘unevenly yoked’. Desires of the flesh exist as well—one desires a man/woman, yet he/she is a married man/woman OR your mate you desire ‘loves’ you on one hand, but is committing domestic violence on another). Final example: one may desire in his/her heart a $50K car or a pair of diamond earrings, but his/her income or financial commitments and priorities dictate now is not the time to purchase it. Some of our heart desires are not within God’s will. I also would not apply number two to it. Yes – We must remember though that God is not against us having material things in the world, rather he is against material things having us. And, we must also be keen to remember that if you pray for material things and do not get them, you should examine your life and ask yourself, “Am I safe for success?” – meaning, if success comes, will it control you and take you away from God? Or will, when the success comes, make you thankful unto God…. These are important points to remember when you pray for anything. Trusting him for real, is the key for everything – Trust…. Is it scriptual? This was the first question. If you answer “yes” to this, THEN you ask yourself if it’s your heart’s desire. If something scriptuarlly correct is my heart’s desire, THEN it’s perfectly good in God’s eyes. It is indeed in detail to study. Thank you mam for your lessons. Thank you, this has been very helpful. Keep up the good work. All the quotes related to God are so amazing. God is Love and Love is God…!! Also want to add, sometimes God may prosper you, so that you can give what God blessed you with, to someone else! Sometimes God wants to see, “If I give you this or that and tell you to give it to this or that person, will you still obey and do what I want you to do?, Or will you turn selfish and love what I have given you, more than me, the giver?” – God’s personality always amazes me. Blessings and Shalom to you all. Next post: Is It Biblical to Receive Unemployment Benefits?